... got it from giveawayoftheday and worked about half a year with it. Nice program. Wish I could try it out longer but I'm unwilling to spend too much time on a program that claims to be free yet stops working in 29 days. I only give 5 stars to exceptional programs and -1 for a false claim. I'll keep using ClipX which actually is free. There is one-day 50% discount for Clipdiary today. You can get it for only $10. looks fine but i'll stick with clipx. Since I switched to Linux as my primary OS over a year ago, I rarely bother to change or even update my Windows software. 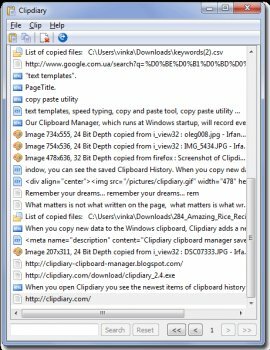 This program was worth changing to however, as it's comparatively lightweight, and seems to have fewer limitations than most other clipboard extenders. I'm always in the market for a better Clip utility. Or is it unlimited? Is 'everything forever' getting autocopied somewhere for easy retrieval? Tried a few of them, this one was small and just what I wanted, great program. Excellent. Keeps a record of anything you copy. Probably tryed like 6 different ones, stayed with this one. I give rete two because this is freeware. This is great! I have been looking for a long time for something like this. Works great.